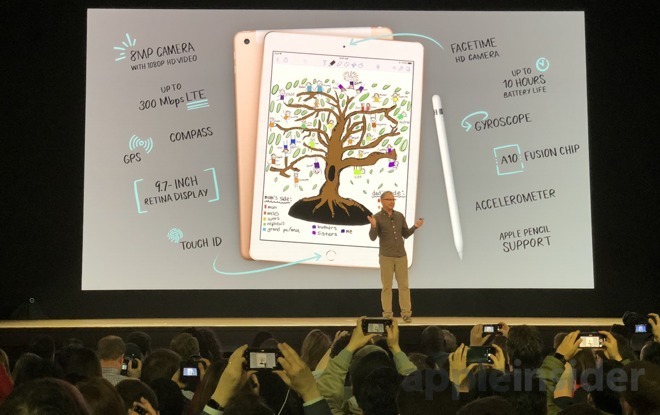 Apple's unveiling of the 2018 iPad focused heavily on the usage of the Apple Pencil and how it is an ideal computing device for education. This feature alone may be compelling enough for existing iPad owners to buy the new device, but putting that addition aside for the moment, the iPad on its own is probably enough of an improvement to warrant a purchase. Looking at the basic specifications of the 2018 iPad in comparison to the 2017 iPad, the iPad Air 2, and iPad Air, there's oddly very little between them all. This is not just in general appearance, but many of the core functions and features that users expect when they look at an iPad. A quick glance at the above chart seemingly suggests there aren't that many changes between the models, despite the group's release dates spanning five and a half years. With the exception of the iPad Air 2, Apple continues to make the iPad 7.5 millimeters thick, meaning the new model should fit in older cases fairly comfortably. The 9.7-inch display in the 2018 iPad remains unchanged in terms of size, with the same 1536 by 2048-resolution screen and the 264ppi pixel density. Even the overall 9.45 by 6.67-inch size is the same as earlier versions. The battery in the newest model is a bit smaller than the iPad Air and 2017 version's 32.9 watt-hour capacities, weighing in at 32.4 watt hours. Unlike the 27.3 watt-hour version in the slimmer iPad Air 2, this reduction is fairly negligible, and Apple continues to claim it has the same 10-hour active battery life as the previous model. The Wi-Fi upgrade to 802.11ac in the iPad Air 2 remain static in the 2018 iPad, with it also continuing to use Touch ID for biometric security. The rear camera still uses an 8-megapixel sensor, introduced to the device range in the iPad Air 2, so even that isn't a major reason for moving to the newest model. The biggest difference that users of older models will likely experience if they try out the newest version will be in its performance running apps. Each progression of the iPad since the Air has used the next generation of the A-series chip, with each successive upgrade bringing with it an improvement to the tablet's processing power. In last year's comparison of the 2017 iPad against the two Air models, it was shown to have a considerably higher pair of Geekbench 4 scores. While the A9 chip's muli-core score wasn't a big jump compared to the A8X in the iPad Air 2, the single-core result was viewed as a massive leap forwards. As it is always unclear how the day-to-day use of an iPad uses symmetrical multiprocessing, the multi-core result's minor improvement probably called the A9 upgrade into question by some parties. By comparison, the move to the A10 Fusion probably won't raise similar issues. Initial Geekbench 4 tests for the 2018 iPad reported by iMore say it achieved a score of 3254 for single-core and 5857 for multi-core. This puts it similar to the iPhone 7's results of 3387 and 5694 for single and multi-core tests respectively, which makes sense as the iPhone uses the same processor and has the same 2GB of RAM as the 2018 iPad. In theory, this is an improvement of about 28 percent for single and 33 percent for multi-core performance when comparing the 2018 iPad to the 2017 model. Put against the iPad Air 2, the single-core score for the 2018 iPad is about 80 percent better, as well as an admirable 40 percent increase for multi-core. Against the iPad Air's dual-core A7 and 1GB of RAM compared to the 2GB in the other models, the single and multi-core score increases rise even higher, to 245 and 260 percent respectively. If processing power is an important factor to users, the potential performance increases alone make the upgrade from the iPad Air and Air 2 extremely attractive. Ahead of an expected teardown of the new hardware, it is probable that the new iPad will be quite similar to earlier models in terms of repairability, with relatively few changes. The 2017 iPad was constructed in a similar way to the iPad Air, using the same unfused display as the older model, rather than the thinner laminated touch panel found in the iPad Air 2. 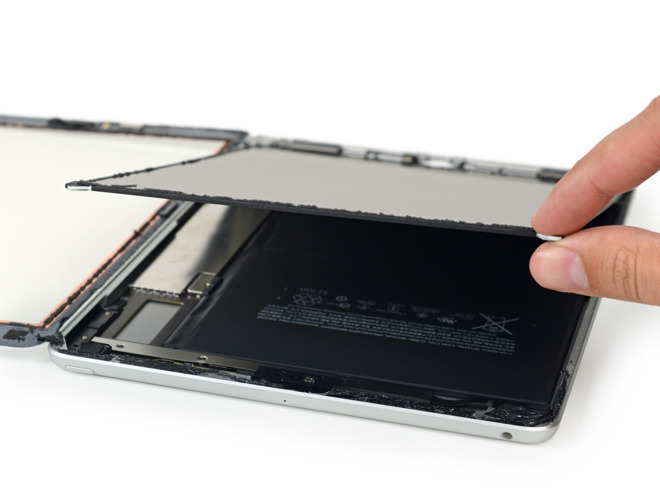 The similarity between the 2017 iPad and iPad Air's components even went as far as the two using identical connectors in some areas. It is currently unclear what kind of display assembly is being used in the 2018 iPad, but the addition of Pencil support means there may be some design cues carried over from the iPad Pro range. The similarly-sized 9.7-inch iPad Pro had the LCD and front panel glass fused together, which made it simpler to open but upped the cost of screen repair. As for the rest of the components, it's probably safe to consider them on a par with the 2017 iPad to repair. Even so, for most users, this isn't really an issue, as the majority of iPad owners will be handing over their damaged or faulty devices to Apple or a third-party repair shop instead of tackling the fix for themselves. Cost of repair will remain a factor, and will largely depend on which display production technique Apple uses. 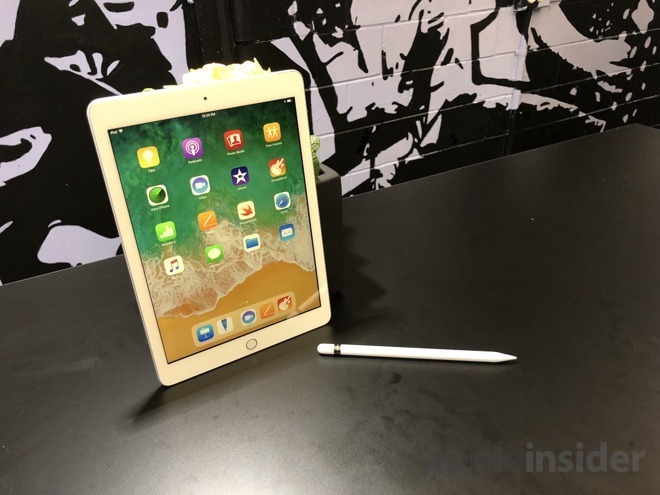 Looking at it as a standalone tablet without the Apple Pencil, the 2018 iPad is certainly a good candidate for owners of the iPad Air and iPad Air 2, at least when looking at the numbers. From a performance perspective, the two tablets are handily thrashed by the processing power of the new model, even more so than the improvements seen in the 2017 update. The low $329 cost of the 2018 iPad also makes it a relatively cheap upgrade, putting it at the same price as the 2017 version for consumers. Existing 2017 iPad owners will not be as enthusiastic to upgrade to the 2018 version just based on the performance bump. The similarities between the two models for the cameras, display, battery life, and other elements will probably make 2017 iPad owners strongly consider sticking to what they've got for at least another year, maybe two. Of course, this all doesn't take into account the addition of Apple Pencil support. For those who have coveted the iPad Pro range's stylus input but avoided upgrading over cost, the added functionality makes the move to the 2018 iPad highly beneficial for iPad Air and Air 2 owners, even with the additional $99 cost for the Apple Pencil. It is also arguable that the draw of a cheap Apple Pencil-enabled device could encourage 2017 users to upgrade as well, but only if it is highly desired by those thinking about buying one. Apple's continued efforts to make iPad a central part of education are certainly helped with the addition of Apple Pencil support, with both the 2018 iPad and Apple Pencil discounted under institutional pricing to $299 and $89 respectively. The existence of the Logitech Crayon as a $49 alternative to the Apple Pencil makes the acquisition more tempting for schools already keen on the idea of adding iPads to their classrooms. Home users looking for the best deal on the 2018 iPad can also save by purchasing from an Apple authorized reseller with no sales tax in many states.